Tony, here is a neck that Ken just sent to me for my daughter's build. It's mahogany with maple sandwiching bloodwood. I'm loving it. I know the 3rd pic is the face up of the headstock, but you can figure out the other side too. I'm going to start a build thread on that one tonight or tomorrow. Thats a nice neck. I am looking at something similar but with the widths reversed. The BW will be thicker than the maple. And its going to be a walnut neck. But thats really nice. I thought I knew what I was going to order until Ken told me about the lam necks!! Its been hell for me ever since!! What wood is underneath the neck there? 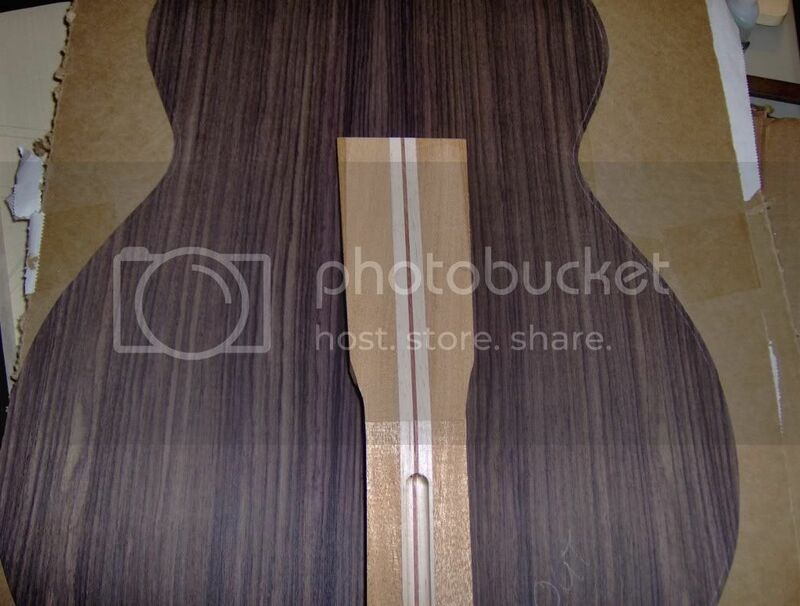 That's the rosewood back for this kit. Yeh, reversing them would be good. 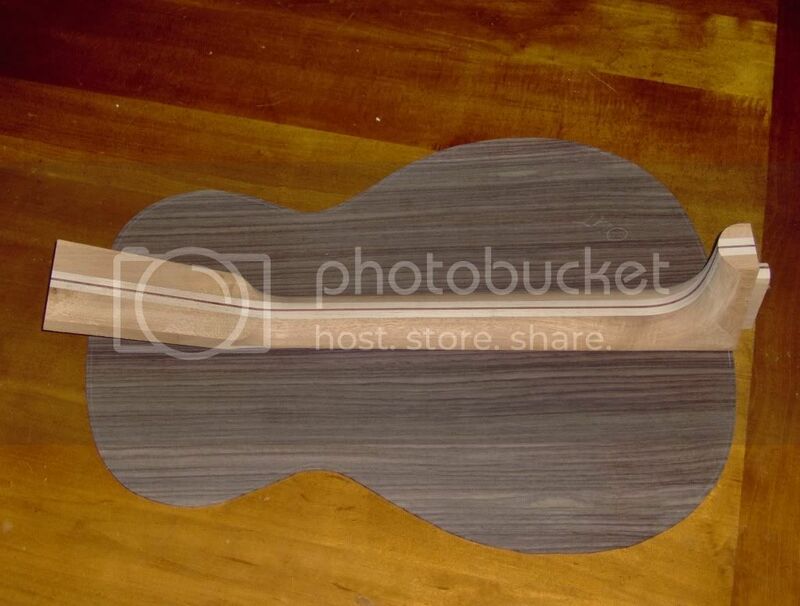 I like it like this because the headstock veneer will be bloodwood, as are the bindings and fretboard binding. This way for me gives it just the accent I want. Tony, I have done a few with laminated necks. 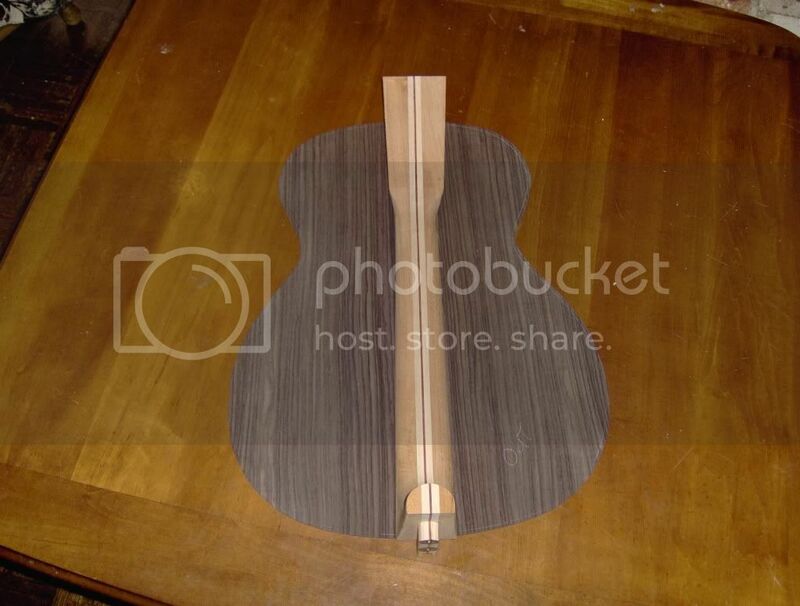 Below is a five piece mahogany with tiger maple center strip flanked by brazilian rosewood. Sorry I don't have a better picture of just the neck. The one I am working on now is a simple three piece mahogany with a thin pin of EIR. I generally try to play my neck laminates off the rest of the guitar so they look planned rather than just bought off a shelf and bolted on. The J-185 used flamed maple and the same brazilian pins I used on the purflings. The claro walnut FB-185 used the same purflings as the rest of the guitar and the center strip is curly koa like the bindings. I think the laminated necks look great, and the laminations certainly help maintain the structural integrity. Ken C, you have got some fine looking guitars! I love that maple bodied one. I don't recall seeing that one before. Good topic, Tony. I have some cherry boards that were flatsawn. I want to make necks out of them and I'm not sure what to laminate them with yet. Cherry is nice looking too. I didn't make this--found it on google image search, and I like it. it's cherry-maple-cherry with carbon fiber strips. Thanks Martin. My 85 year old Dad has that Maple SJ, and he gives it a regular work out! Here is a link to Chris' website where I get my necks. He has lots of pictures of laminated necks: Hanalei Moon. I seem to spend as much time making necks as I do making bodies. The only thing different is that I try to have necks made up at least 6 months before I need them. It's important to arrange the grain appropriately to insure stability. End grain of the mahogany should look like this...((())) or this...)))(((. I glue up the laminated neck blocks to 3+" x 4+" x 28" and let them sit for 3 months. I then joint them straight and square, cut out the 2 neck blanks and let them sit for at least another 3 months. When I'm ready for use I joint them again and proceed with the final operations before turning them into necks. In addition to the laminations helping with strength, stiffness and stability, I also add 2 carbon-fiber rods on either side of the truss rod slot. After following this procedure for 8 years, I have yet to get a warped or unstable neck...to me it's one of my most critical jobs in building the guitar. Nice looking guitars Ken,And great looking photo's!! !